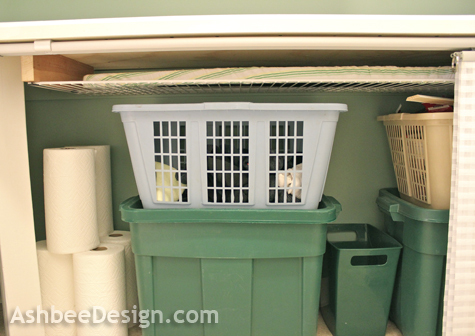 This is the fifth post in my laundry room reveal series. Click here to start at the first post. It needs a home. The home has to be convenient and easy. Reality is we have to vacuum often. 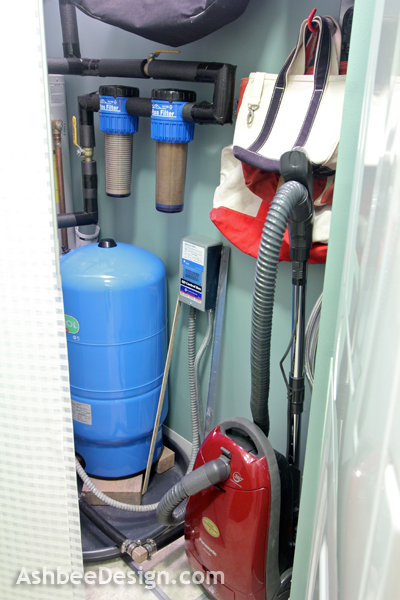 My solution was to keep an assigned place right in the front corner of the utility area for the vacuum cleaner. Slide open the IKEA Kvartal sliding panel and right there is the vacuum cleaner. I also put a double outlet in this location hoping someday there will be a cordless option. And I might add another dust buster to the wall there as well. Trying to predict technology here. I have put in tall cabinets as high as posible. I wanted to use every square inch of storage space. Inconvenient storage space is fine for items rarely used and it is absolutely better than no storage space for them! 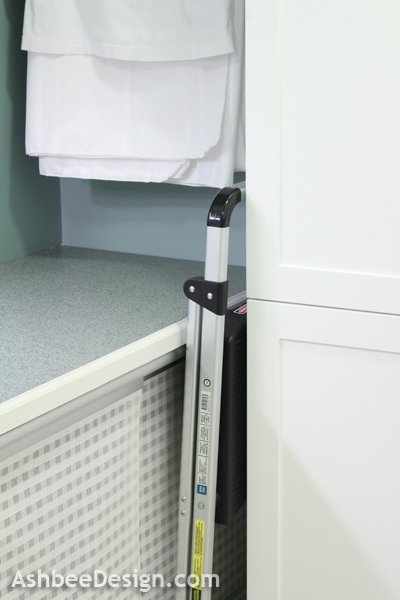 Solution: Design in a space for a sturdy, easy to use folding stool to allow for easy access to high shelves. David and I discussed this one at length. Originally I had the stool over on the side of the washing machine but as the room took shape, it was clear we needed it in the cabinet alcove. I narrowed the folding table a little more to make room for the stool right next to the cabinets. I use it all the time and it is quick and convenient. We had a recycling bin right inside the laundry room door in the old laundry space. David insisted the new room needed one there as well and getting that to fit caused some adjusting by the cabinet designer. But she did it and right inside the door, inside a closed cabinet is a double layer recycling area. The lower area is a big bin for our single stream stuff. It easily slides out when full and gets replaced by another. Above on the shelf is a bin for junk mail - papers, etc. The cabinet works well and we prefer the recycling out of sight. Like all good New Englanders I have an extensive collection of L.L. Bean canvas bags (plus assorted others). I used to store these in the back of our bedroom closet, behind the hamper, under the stairs. Each time I needed one (which was often) I had to go digging in the dark. I decided there would be convenient storage for my collection of bags in this refurbished space. 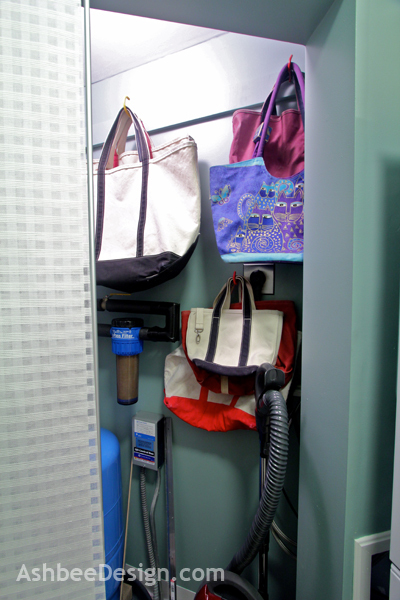 I added heavy duty hooks to the wall in the utility area to hang my bag assortment. This was one of the first things I moved into the new area and it is a huge improvement! 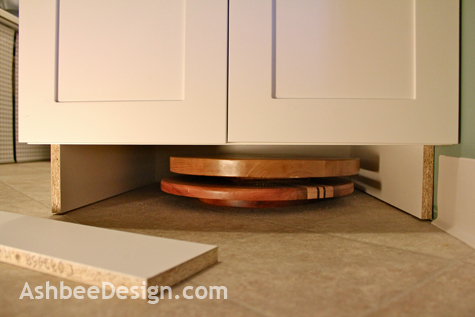 I love the idea of using the space behind the cabinet kick boards for added storage. I requested that the kick boards not be attached. The fit is tight enough that they stay in place and I can pop them out as needed to have access to that large flat space behind. I currently have my lazy Susans in one. This room is my laundry room primarily and in the old laundry room I had several laundry baskets and several large bins. The laundry baskets are used regularly for all types of things and the large bins were easy storage for clothes to donate - part of the on going thinning out process. Both are large and needed dedicated space in the new room. I didn't put cabinets under the folding table but instead always kept in ming this sizes of the laundry baskets and storage bins. As I modified things I needed to be sure to leave spaces for these large items. There is one important item that didn't fit into the redesigned space and that is my folding chairs. I have six that get used during those big entertaining events. Originally I had thought they would go on wall brackets above the water pressure tank. Once we started working with the plumber, he suggested a water filtration system to help with the the high sediment level we have in our well water. That took up the space that was reserved for the chairs. I then thought I would move them to the wall next to the fuse box, but then the electrician came and said we needed to expand our fuse box to take care of the added electricity I wanted in this room. So I lost access to that wall. In the end the chairs had no home and were moved to the top of the garage. If being organized was a contest, you have come in first and I am a distant second. I think I am very organized with specific spots for the folding chairs, the 4 foot stepladder, the recycling, etc. However, I would NEVER have thought of storing things behind the kickplates! I can't even imagine how you came up with that idea. Please continue to post more organizing ideas as yours are excellent! Storing behind the kick plate isn't my idea. I've seen it bouncing around pinterest and there are units now that are little drawers for that area. I couldn't use the standard drawer units because my cabinets aren't standard depth so I just used the space without the drawers. Works well for those big flat things and a whole lot less expensive. 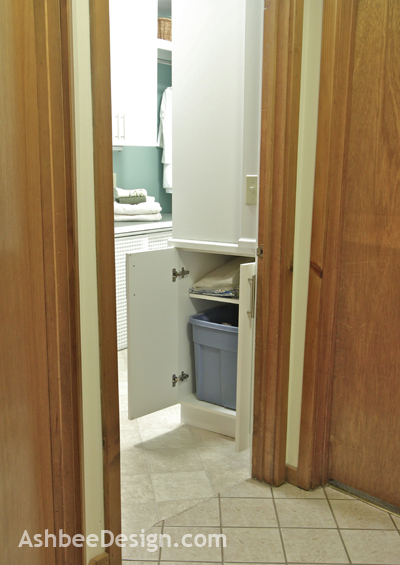 Also, not using the drawers increases the usable storage space. I'll keep posting organizing ideas as I implement them.- And letting you know which ones didn't work! Here is a link to a life hacker article about using the kick plate area.